Nick Parker | Life is short,have fun!!! This is the aircraft that will be on the frontline in the mission to protect spectators and athletes from terrorism during the Olympics. The Boeing E-3 Sentry has helped the military carry out thousands of missions in war zones across the globe, including Bosnia, Afghanistan and Iraq. But now, this state-of-the art aircraft, is set for a crucial role closer to home, guarding against threats during this summer’s London Games. The £179m plane, which features an all-seeing radar housed in the distinctive dome, enables armed forces to find, target and neutralise threats from land, sea or air from hundreds of miles. Defence chiefs have drafted the fearsome aircraft in to help orchestrate the enormous task of keeping the public safe from all form of attack. 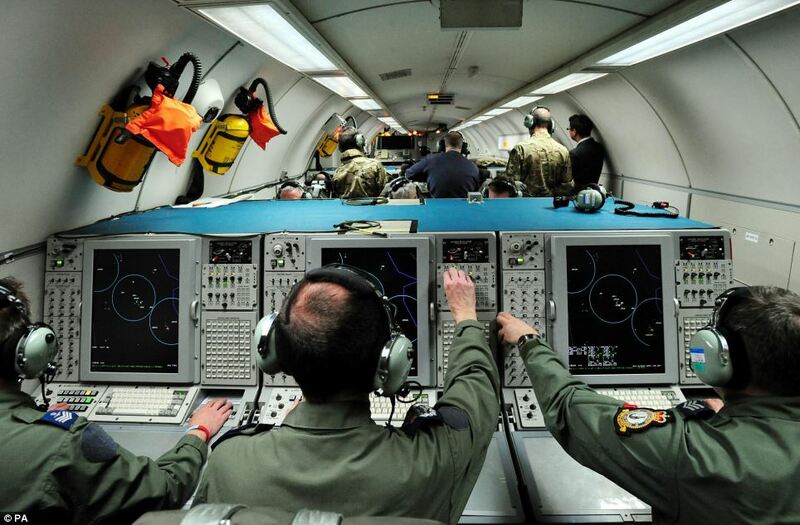 The RAF operates seven E-3D Sentry aircraft in the airborne surveillance and command-and-control role. The aircraft are based at RAF Waddington, in Lincolnshire, where they are operated by number 8 and 23 Squadrons. 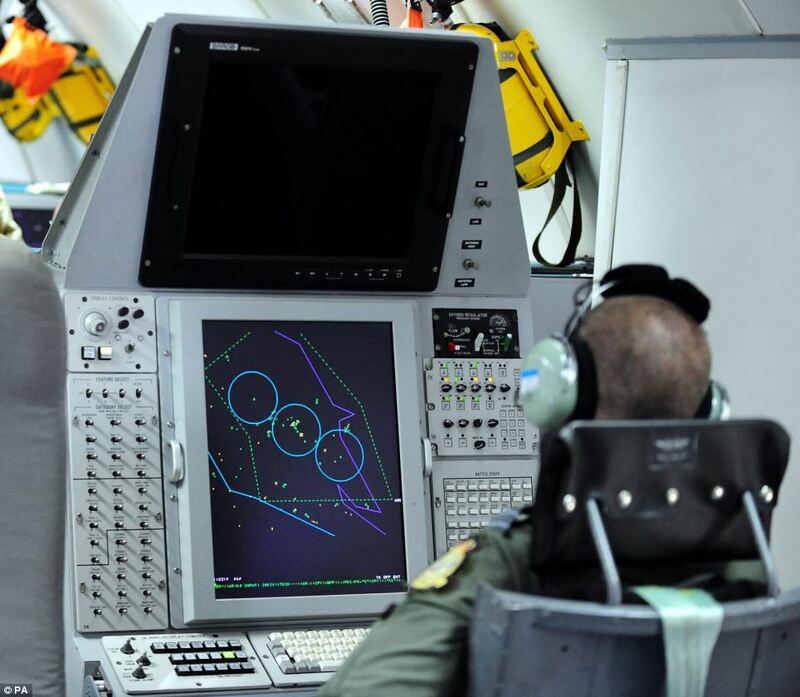 E- 3D has been extensively employed in the Airborne Warning and Control System (AWACS) role. The E-3D Sentry, known to the RAF as the AEW1, is based on the commercial Boeing 707-320B aircraft, which has been extensively modified and updated to accommodate modern mission systems. Mission endurance is approximately 11 hours or more than 5,000 nautical miles without the need to refuel. But the E-3D is the only aircraft in the RAF’s inventory capable of air-to-air refuelling by both the American ‘flying-boom’ system and the RAF’s ‘probe-and-drogue’ method. Yesterday, Defence Secretary Philip Hammond visited the base to observe an air security training exercise and meet members of the armed forces who will be providing airborne security throughout the summer. During the visit he stressed that security plans have been put in place for the Olympic Games to make sure the UK is ‘prepared in every respect’ to deal with any threats. Philip Hammond said the potential of any outside threat or danger at this summer’s Games was ‘hopefully very unlikely’ but said a huge operation was ready to deal with anything that might go wrong. He said: ‘Part of this exercise is making anyone with ill intention aware of the layered air defence that will be in place. He added: ‘Ever since 9/11 we’ve had a routine plan in place to deal with the possibility of a rogue airliner. 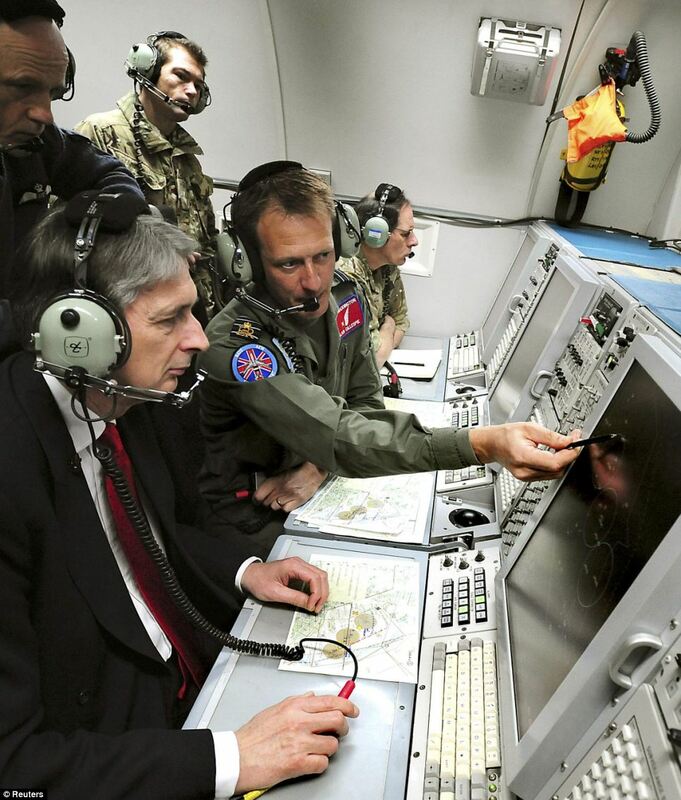 Mr Hammond sat with General Sir Nick Parker and E-3D Sentry personnel in the mission crew area and viewed a scenario in which a rogue aircraft headed towards a target area and RAF Typhoons were scrambled from Coningsby in Lincolnshire, as well as a helicopter and sniper who could either ‘take out’ the pilot or the rogue aircraft’s engine. 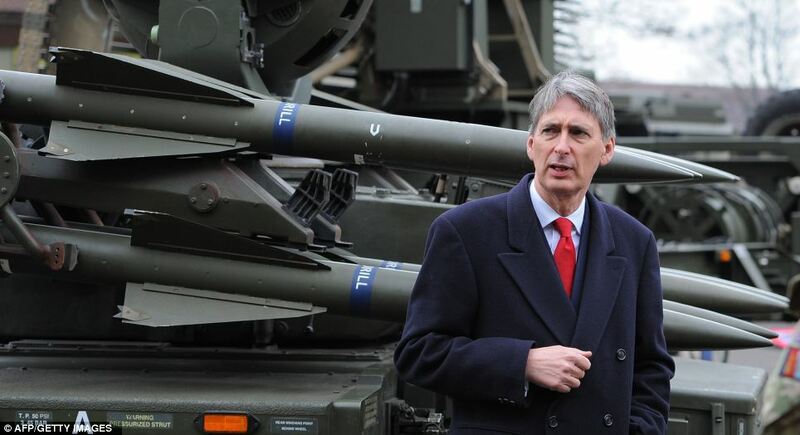 Mr Hammond said a ‘number of ministers’ would be involved in the decision-making process if such action was needed and was confident military personnel could deal effectively with all scenarios. Yesterday’s exercise was also to provide reassurance to ‘friends and allies’ who were sending teams to the Games, he added. 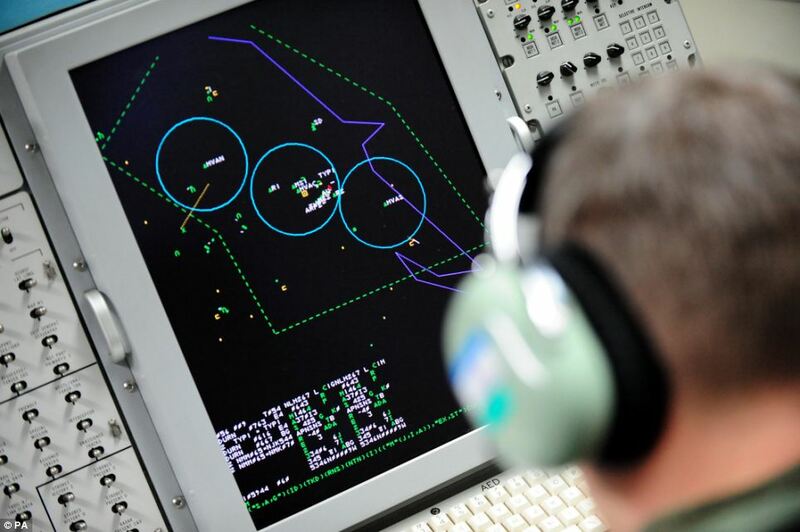 The E-3D Sentry carried out a two-hour test run of the exercise, codenamed Taurus Mountain, over Leamington, Dishforth and the east coast of the UK yesterday morning. The plane’s Northrop Grumman AN/APY-2 high-performance, multimode lookdown radar is able to separate airborne and maritime targets from ground and sea clutter. One E-3D flying at 30,000ft can scan at distances of over 300 nautical miles. It can detect low-flying targets or maritime surface contacts within 215 nautical miles and it can detect medium-level airborne targets at ranges in excess of 280 nautical miles. The multi-mode radar provides lookdown surveillance to the radar horizon and an electronic vertical scan of the radar beam provides target elevation and beyond-the-horizon operation for long-range surveillance of medium and high-altitude aircraft. These attributes allow it to determine the location, altitude, course and speed of large numbers of airborne targets. Flight Lieutenant Craige Curry said the plane and crew acted as the ‘eyes in the sky’ for areas where low-level radars could not reach and fed data back to the ground so a full security picture could be seen. He said: ‘We’ve been involved in supporting numerous Olympics events over the years,’ he said. ‘We call them ‘high visibility events’, which the Olympics is this year. Flt Lt Curry said the crew would be looking for anything and everything in the air during the Games. ‘Anything that flies we’ll be trying to build a picture of,’ he said. 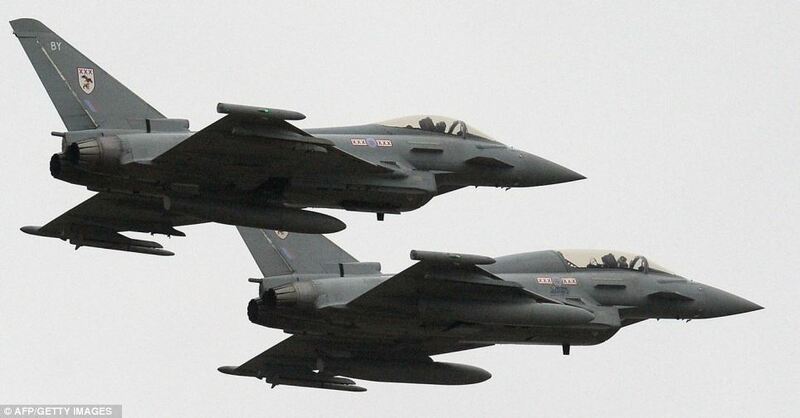 Aircraft and ground units will be part of the multi-layered air defences for the Games, including RAF Typhoon interceptors, RAF E-3D Sentry and Royal Navy Sea King surveillance aircraft. Sniper-carrying RAF Puma and Navy Lynx helicopters, as well as RAF radar systems and air defence missile systems, will all be in place. 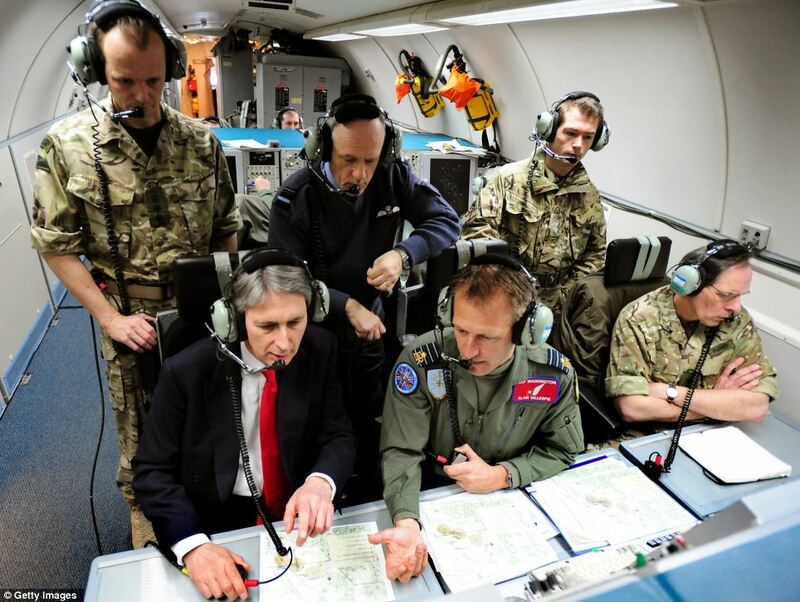 Once the flight had finished and landed back at RAF Waddington Mr Hammond viewed a number of military aircraft and met personnel. Air Vice Marshal Stuart Atha said the principles that underpin air security plans for the Olympics meant extra assets were able to be brought in, and ‘rapid and appropriate’ decision making was the same as on any other day of the year. Asked if he was confident air crews could manage and maintain security, he said: ‘That’s what today’s about – it’s about exercising. ‘It’s just like Olympic athletes are preparing for the Games – well so are we. ‘We’re preparing for the Games to bring all these different assets together so that we can be prepared to deliver a safe and secure Olympics, but also doing it from the air in a way that preserves the spirit and the culture of the Games. The armed forces have been keen to show off their capability to counter terrorism in the build up to the Games. Around 100 marines and 50 officers rehearsed a string of high-speed drills amid fears attackers could use the waterways to launch onslaughts on London landmarks, earlier this year. The Thames runs directly past the O2 Arena, which will be known as the North Greenwich Arena for the purpose of the Games, when it will host events including gymnastics. The river will also be used to transport tourists between venues via water buses and a new cable car.